The Toronto Blue Jays have teamed up with the Fire Marshal's Public Fire Safety Council in Ontario to produce a set of baseball cards that promote fire safety. More than 200 fire departments throughout the province will be handing out the cards to local youth as a part of the Swing into Summer Safety awareness campaign. Cards were also given out during the June 16th game between Toronto and the Baltimore Orioles. In all, 32 cards make up the set. 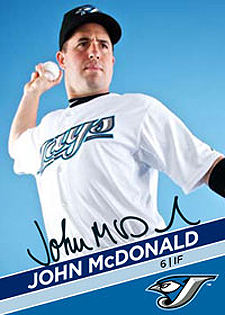 Card fronts feature Blue Jays players and a facsimile autograph, while the backs offer fire safety tips. Approximately 135,000 sets will be distributed by the time the campaign wraps up. Despite the massive print run, like many oddball regional sets, it may be difficult to find the cards, particularly for those who live outside of Ontario. The Blue Jays have a long history of similar sets promoting fire safety. Promotional sets date back to 1984, although no Toronto sets seem to have been made since the 1990s. If you find them, these sorts of oddball sets are reasonably priced given their non-traditional distribution methods and strong likelihood that most end up in the pockets of non-collectors.